Sometimes it takes a shake-up in routine to see the advantages of doing something in a new way. The recent snow storms in the Northeast have wreaked havoc on transportation — to such an extent that web editor Eric Convey spent nearly four hours trying to get to work one morning this week, until finally settling in at a Starbucks. Read more: How one really rotten day trying to get to work highlighted the benefits of telecommuting. There’s nothing more thrilling for a kid than a snow day. 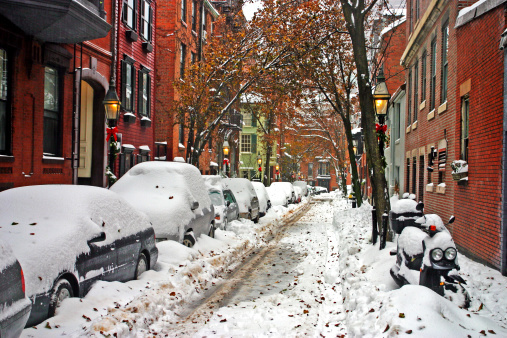 But for working parents, snow days can be a nightmare — especially when they come one after another without relief as they have done in Boston this winter. Brad Harrington, Executive Director of 1MFWF Supporter Boston College Center for Work & Family, explains how flexibility can help relieve the stress for parents and be good for business as well. Read more: Say it Ain’t Snow: A Working Parent’s Dilemma. Working from home is typically touted as the solution for getting closer to the elusive work/life balance. But many workers who take advantage of this supposed “perk” end up working more hours than their in-office counterparts, due to what’s known as the “flexibility stigma”. Read more: The Hidden Cost of a Flexible Job. A new study from Workplace Trends and Career Arc has found that employers are off the mark when it comes to recognizing employee needs around work/life balance. 67 percent of HR professionals think their employees have work-life balance, but 45 percent of employees say they struggle to find time for personal activities. 50% of employers rank work flexibility as the most important benefit they believe their employees want, whereas 75% of employees rank work flex number one. Read more from Workplace Trends Founder Dan Schawbel: Yes, There Is a Disconnect Between Employers and Employees on Work-Life Balance. A fictionalized case-study in the Harvard Business Review presents a thought-provoking work-from-home scenario and calls for reader input. Our director Emma Plumb added her suggestions — take a look in the comments section under “Plumb” and join the conversation.